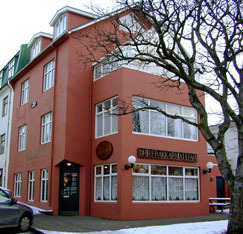 3 Frakkar Restaurant, or Þrír Frakkar as it is known in Icelandic and translates as 3 French Coats, owned by Chef Úlfar Eysteinsson and his family since 1989, features a homey, cozy ambience with nautical décor throughout, and is conveniently located in the downtown area a short stroll off the main shopping streets. The intimate 44-seat restaurant features lace covered windows, wood ladder-back chairs with black leather seats flank tables doubled draped with beige linens and hunter green scalloped edged linens accessorized with vases of fresh roses, and low background music completes the ambience. Edward and I had lunch at 3 Frakkar in late September 2009, where we sat in a sunny room by a window and enjoyed looking at the many interesting objet d'art that line the walls. The restaurant provides guests with an authentic Icelandic culinary experience complete with puffin, whale meat (minke or fin depending on the season), trout, salmon, lamb, and reindeer (when in season) on the menu. We began with an appetizer plate that showcased the bounty of Iceland that included Smoked Puffin Breast with Mustard Sauce (Reyktur Lundi með sinnepssósu), Graved Trout from Þingvellir with Mustard Dill Sauce (Grafin Þingvalla Bleikja með graflax sósu), Raw Whale Meat Sashimi Japanese Way (Hrár Hvalur Sasimi að japönskum sið), and Traditionally Smoked Trout with Scrambled Eggs and Chantilly Sauce (Taðreyktur Skútustaða Silungur með eggjahræru og chantilly sósu). The presentation was beautiful, an artist's palette of color accompanied by a bowl of soy sauce, wasabi, and pickled ginger, with different smoking techniques used for the puffin and the fish. For his main course, Edward had the Butter-fried Fillet of Plaice with Shrimp "Gratin" (Heilsteikt Rauðsprettuflök með rækjum "gratin") that was an ample and tasty dish attractively presented with four graduating in size boiled potatoes and crinkle cut carrots. 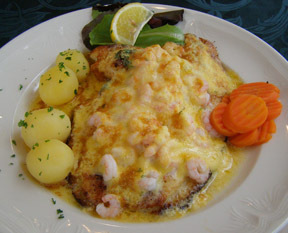 The fish and shrimp were extremely fresh and flavorful under their inviting blanket of golden brown cheese. I had the Fried Lemon Spiced Fillet of Redfish with Mild Wasabi Sauce (Heilsteikt sítrónukrydduđ Karfaflök međ mildri wasabi sósu), which was gorgeously presented. 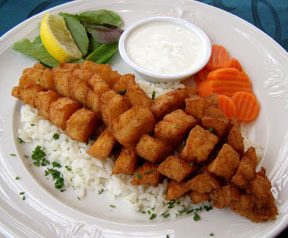 Chef Stefan Úlfarsson had removed the bones, left the fish intact, cubed it, and then deep-fried it. The fish was very tender and delicious and when I met with him later, I asked how he was able to craft the presentation of the fish, and he told me that the secret was that the skin held the fish in place, influenced by Japanese technique. 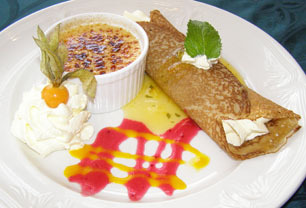 We continued our exploration of all things Icelandic with dessert where we indulged in Skyr Brûlée (a traditional Icelandic cultured dairy product similar to strained yoghurt), Honey Crepes filled with Honey Cream and Grand Marnier Marmalade (Hunangs rjóma pönnukaka með Grand Marnier mauki) accompanied with Cream Chantilly and garnished with my favorite physalis (cape gooseberries), and vanilla ice cream drizzled with raspberry and mango sauce. Speaking with Chef Úlfar Eysteinsson and Chef Stefan Úlfarsson after lunch, we learned about the seasonality of their menu that will include more game and meat as it comes into season, and that their focus is on using the freshest local products available. 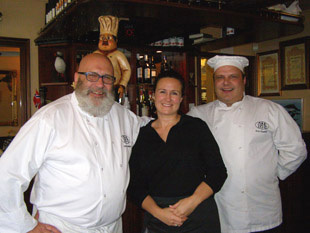 To quote Chef Stefan Úlfarsson "food should not travel, people should travel." 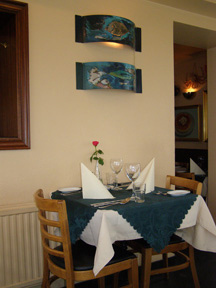 With fresh ingredients expertly prepared, a cozy ambience, welcoming and attentive service, it comes as no surprise that 3 Frakkar has been a favorite of "diners in the know" for the past twenty years. 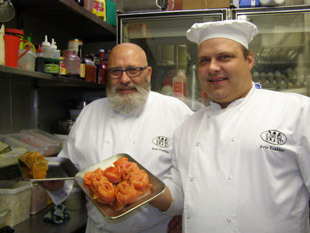 Read about 3 Frakkar Restaurant in the Chefs' Recipes section where Chef Úlfar Eysteinsson and Chef Stefan Úlfarsson share a taste of the restaurant with their delicious recipe for Hashed Fish Úlfar's Style with Black Bread in English and in Icelandic.